​Einstein in 1905 suggested that light has dual nature, i.e. wave nature as well as particle nature. Louis de Broglie, a French physicist, in 1924, suggested that all microscopic as well as macroscopic objects possesses dual character. The wave associated with the particle is called a matter wave or a de Broglie wave. where ν is the frequency of the wave and h is Planck’s Constant. 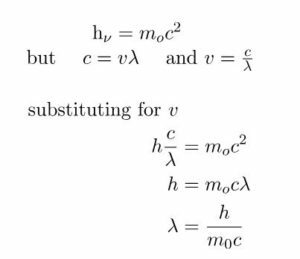 where m is the mass of the photon and c is the velocity of light. The above equation is called de Broglie Equation and λ is called de Broglie wavelength. de Broglie wavelength of a particle is inversely proportional to its momentum. De Broglie equation relate the particle character with the wave character of matter. Consider a ball of mass 0.1 kg moving with a speed of 60 m/s. Wavelength is too small for ordinary observation. It has significant only in case of microscopic particles. de Broglie relationship has no significance in everyday life. That is why we do not observe any wave nature associated with the motion of a running car or a cricket ball. Davisson and Germer in 1927 observed that when a beam of electrons is allowed to fall on the surface of nickel crystal and the scattered or reflected rays are received on a photographic plate, a diffraction pattern (consisting of number of concentric rings) similar to that produced by X-ray, is obtained. Since X-ray are electromagnetic waves ie.they are confirmed to have wave character, therefore electrons must also have wave character. He performed experiment with thin foil of gold in place of nickel crystal. He observed that if the beam of electrons after passing through the thin foil of gold is received on the photographic plate placed perpendicular to the direction of the beam, a diffraction pattern is observed. When an electron strikes a zinc sulphide screen, a spot of light known as scintillation is produced. Since a scintillation is localised on the zinc sulphide screen, therefore, the striking electron which produces it also must be localised and not spread out on the screen. The localised character is possessed by the particles .Hence electrons has particle character. (2) Milliken Oil Drop experiment for determination of charge on electron also show that electron has particle character. (3) The phenomenon of black body radiation and Photoelectric effect also Prove the particle nature of radiation. According to Bohr’s model, the electron revolves around the nucleus in circular orbits. According to de Broglie concept, the electron is not only a particle but has a wave character.